This week’s instalment of the #SBIDinspire features a design project with particular grandeur. Stonehill & Taylor upheld a traditional design scheme sympathetic to the historically Federalist architecture as they crafted a hotel suite fit for royalty – or in this case, a Presidential audience. Located on the 14th floor and newly expanded to 4,000 square-feet, the Presidential Suite features historic accents and elegant furnishings, as well as an array of artwork ranging from pastoral landscapes to Chinoiserie accent pieces. 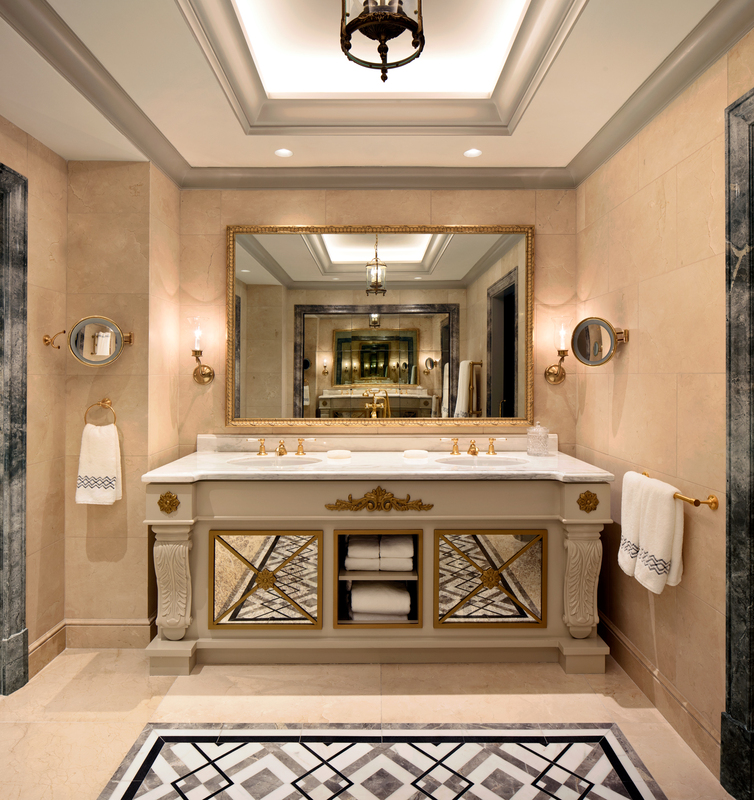 Immediately upon entrance to the space, the grand entry hallway sets the tone for the suite, with floors elaborately patterned in three types of marble. This exits dramatically into the rotunda, a bright, 12-foot-high octagonal dome that opens to the reception, fitness room, and master bedroom entryway. The living room area features gold, rich red, and pewter details with a baby grand piano as the focal point, while the bedrooms have a palette of powder blue, cream and taupe. The master bedroom leads to a spacious bathroom haven that features a steam shower and the only freestanding tub in the hotel. SBID had the opportunity to speak with Vince Stroop, Principal with Stonehill & Taylor. In 2012, Stonehill & Taylor came on board to manage the architecture and interior design of room 702 of the InterContinental New York Barclay hotel. Because the hotel has been renovated multiple times throughout the years, its style was often mismatched. Our brief was to strip the hotel back to its original intention, following a Federalist style of architecture and interior design. 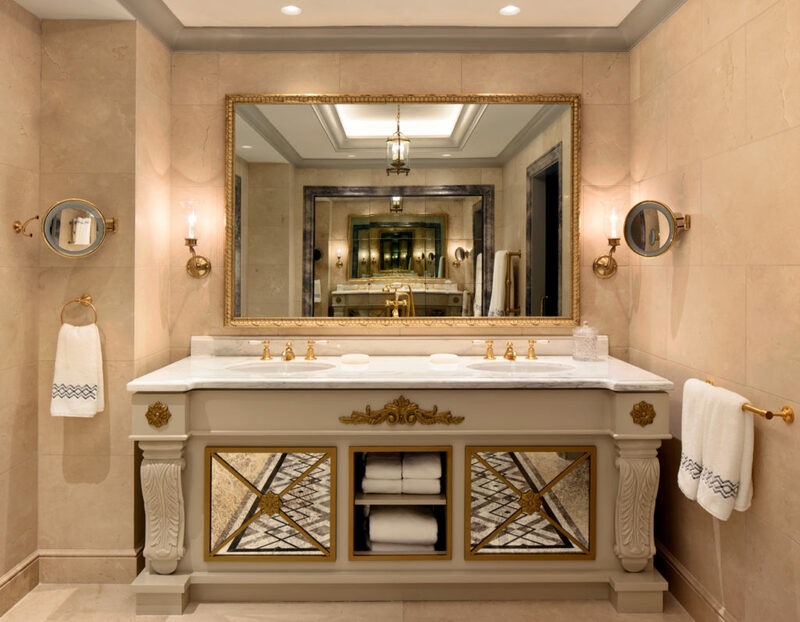 More specifically, we wanted to create flourishes in the Presidential Suite to distinguish it from the rest of the hotel—as a result, you’ll see lots of symmetry, millwork detailing, and the layering of materials like marble and stone. The hotel was originally built in 1926 when there was a revival of the Federalist period. We sought to return to these design principles. Take for example, the Presidential Suite’s grand entry hallway. It features a classic floor pattern created using three types of Italian marble and leads to a dramatic rotunda featuring an 11-foot-high octagonal dome and acts as the centre point of the suite which opens to several of the other main spaces. The Presidential Suite is heavily used by world dignitaries and demanded the latest in technology and high security standards—it required a separate HVAC system, shatter-proof glass, bulletproof wall construction, and sound-proofing—which was tricky to reconcile with the classic nature and traditional style of the design brief. This hotel is located very close to the United Nations Complex and deeply rooted in political history. Bill Clinton even ran his 1992 Presidential campaign from its very address. The real excitement however, is that former President Barack Obama has stayed in the Presidential Suite both before and after restoration and former Vice President Joe Biden was the first to occupy the suite post-renovation. Our involvement with the hotel and the suite was a labour of love, and it’s thrilling to think that it’s used and appreciated by leaders from around the world. We entered the competition to bring recognition to this project and to offer the SBID audience a window in to the hotel’s design. The wider public may not have the opportunity to visit the hotel, but through this competition, they can get a glimpse of what it would be like to stay in the Presidential Suite. Questions answered by Vince Stroop, Principal with Stonehill & Taylor.